440 ROC troops killed and missing. 460 PRC troops killed and wounded, 218 civilians killed and wounded. 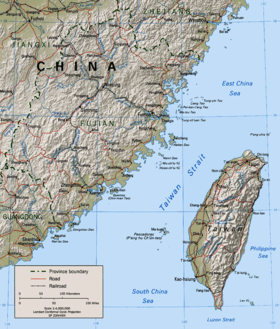 The Second Taiwan Strait Crisis, also called the 1958 Taiwan Strait Crisis, was a conflict that took place between the People's Republic of China (PRC) and the Republic of China (ROC). In this conflict, the PRC shelled the islands of Kinmen and the Matsu Islands along the east coast of mainland China (in the Taiwan Strait) to "liberate" Taiwan from the Chinese Nationalist Party, also known as the Kuomintang (KMT); and to probe the extent of the United States defense of Taiwan's territory. This conflict was a continuation of the First Taiwan Strait Crisis, which had begun immediately after the Korean War ended. 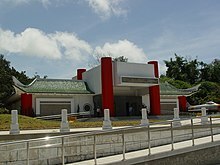 The Nationalist Chinese had begun to build on the island of Kinmen and the nearby Matsu archipelago. During 1954, the PLA began firing artillery at both Kinmen and some of the nearby Matsu islands. The American Eisenhower Administration responded to the request for aid from the ROC according to its obligations in the ROC-United States mutual defense treaty that had been ratified in 1954. President Dwight D. Eisenhower ordered the reinforcement of the U.S. Navy Seventh Fleet in the area, and he ordered American naval vessels to help the Nationalist Chinese government to protect the supply lines to the islands. In addition, the U.S. Air Force deployed F-100D Super Sabres, F-101C Voodoos, F-104A Starfighters, and B-57B Canberras to Taiwan to demonstrate support for the republic. The F-104s were disassembled and airlifted to Taiwan in C-124 Globemaster II transport aircraft, marking the first time such a method was used to move fighter aircraft over a long distance. The U.S. carrier USS Lexington (CVA-16) with a supply ship and USS Marshall (DD-676) off Taiwan during the crisis. F-104As of the 83rd Fighter Interceptor Squadron at Taoyuan Air Base in September 1958. Also, under a secret effort called "Operation Black Magic", the U.S. Navy modified some of the F-86 Sabre fighters of the Nationalist Chinese Air Force with its newly developed early AIM-9 Sidewinder air-to-air missiles. These missiles gave the Nationalist Chinese pilots a decisive edge over the Chinese Communists' Soviet-made MiG-15 and MiG-17 fighters in the skies over the Matsu Islands and the Taiwan Strait. The Nationalist Chinese pilots used the Sidewinder missiles to score numerous kills on PLAAF MiG aircraft. The US Army's contribution reinforced the strategic air defense capability of the Republic of China. A provisional Nike missile battalion was organized at Fort Bliss, TX, and sent via USMTS USS General J. C. Breckinridge (AP-176) to Nationalist China. The 2nd Missile Battalion was augmented with detachments of signal, ordnance and engineers, totaling some 704 personnel. Twelve long-range 203 mm (8-inch) M115 howitzer artillery pieces and numerous[quantify] 155 mm howitzers were transferred from the U.S. Marine Corps to the Army of the Nationalist China. These were sent west to Kinmen Island to gain superiority in the artillery duel back and forth over the straits there. The impact of these powerful but conventional artillery pieces led some members of the PLA to believe that American artillerymen had begun to use nuclear weapons against them. Soon, the Soviet Union dispatched its foreign minister, Andrei Gromyko, to Beijing to discuss the actions of the PLA and the Communist Chinese Air Force (PLAAF), with advice of caution to the Communist Chinese. On September 22, 1958, the Sidewinder missile was used for the first time in air-to-air combat as 32 Republic of China F-86s clashed with 100 PRC (PLAAF) MiGs in a series of aerial engagements. Numerous[quantify] MiGs were shot down by Sidewinders, the first "kills" to be scored by air-to-air missiles in combat. Soon, the People's Republic of China was faced with a stalemate, as the PLA's artillerymen had run out of artillery shells. The Communist Chinese government announced a large decrease in bombardment levels on October 6, 1958. Afterwards, both sides continued to bombard each other with shells containing propaganda leaflets on alternate days of the week. This strange informal arrangement continued until the normalization of diplomatic relations between the United States and the Communist People's Republic of China in 1979. The timed shelling created little damage and casualties; it was mainly aimed at military compounds and artillery pieces. It was also a way to expend expired ammunition and train new artillery crews for the PRC in what eventually became one-way shelling from Mainland China to Taiwanese-controlled territory. The question of "Matsu and Quemoy (Kinmen)" became an issue in the 1960 U.S. presidential election when Richard Nixon accused John F. Kennedy of being unwilling to commit to using nuclear weapons if the Communist China invaded the Nationalist China outposts. The spent shell casings and fragments have become a recyclable resource for steel for the local economy. Since the Second Taiwan Strait Crisis, Kinmen has become famous for its production of meat cleavers made from bombshells. Watry, David M. Diplomacy at the Brink: Eisenhower, Churchill, and Eden in the Cold War. Baton Rouge: Louisiana State University Press, 2014. ^ 國防通識教育 (in Chinese). 五南圖書出版股份有限公司. 2007. ISBN 9789571144924. ^ Davies, Peter E. (2014). F-104 Starfighter Units in Combat. Great Britain: Osprey Publishing. pp. 22–23. ISBN 978-1-78096-313-6. ^ Sidewinder AIM-9. US Naval Academy 2012. Retrieved 21 November 2017. Chen Jian. (2001). Mao's China and the Cold War - Beijing and the Taiwan Strait Crisis of 1958. The University of North Carolina Press. This page was last edited on 14 February 2019, at 15:06 (UTC).